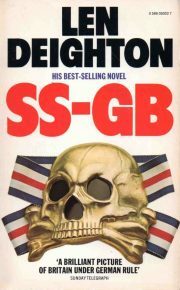 In Len Deighton’s 1976 novel SS-GB, Britain has fallen. King George VI is a prisoner in the Tower, and Churchill has been executed. German troops occupy the cities. It is surely only a matter of time before the last partisans holding out in the countryside are rounded up and shot. Detective Superintendent Douglas Archer’s world is bizarrely normal. He answers to Gruppenführer Fritz Kellerman now, but his job is essentially the same as it was before the invasion: investigate and solve murders. At first glance, there’s nothing about the dead man in the shabby apartment over the antique shop to suggest that the fate of nations depends on Archer’s decisions over the next few days.